On day 3/4, I switched from the hostel ($14/night) to another reservation from Airbnb ($25/night), a bedroom in an apartment building on the eleventh floor. The view of the city from the apartment was gorgeous. North of the apartment, city view of Bogota from Las Aquas station. The apartment is only 30 minutes from the hostel but the neighborhood is not safe to walk at night (La Candelaria), so I spent most of the third day on transport, relaxation and to make plans for the next day — the Salt Cathedral. The transfers can be a bit confusing but just make sure the driver knows that you are going to the Cathedral de Sal. For the life of me, I could not get the correct pronunciation of “cathedral,” plus the towns people knows it as “mineral cathedral.” The best way to get them to understand where I need to go was to show them a picture of the cathedral on my phone. There are several tour plans to choose from, the standard package starts at $23.000 COP and tour departs every half an hour. The cave entrance looks like a bat cave and it is quite chilly down there. Since I could not understand the guide (all in Spanish), I thought the first cross I saw was a tombstone, which made the tour extra eery for me. Later I learned that these are “Stations of the Cross,” which illustrate the events of Jesus’ last journey. Each station has a cross and several kneeling platforms carved into the halite structure. At the base of the tunnel are three chambers. The main one is still used for worship on Sundays. 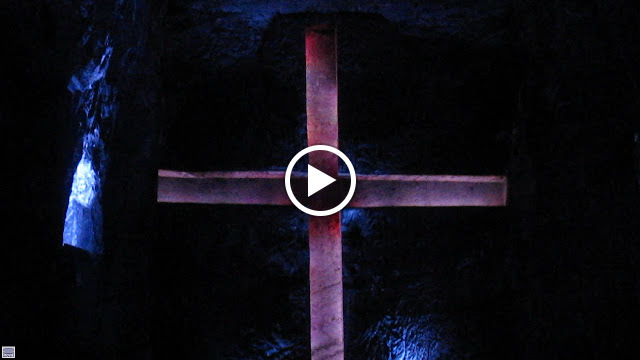 The lighting and sound effects were spot on, adding to the immortality of The Cross. Check out its beating heart! Main auditorium in the Salt Cathedral. On the way back from Zipa I stopped by the hostel to watch the Chile VS. Colombia game. Luckily Colombia tied but also qualified for the World Cup. Otherwise I’m not sure what kind of riot will rise! Yet unfortunately, Colombia won, because the city blocked off the roads in a section of La Candelaria (where I stayed) and I had to walk through the crazy street celebrations to get back to my quarter. Safe and beat!